If you’re looking for summer fun in the sun come to Otters’ Haunt. We are surrounded by water, forests and mountains in the beautiful Vredefort Dome World Heritage Site. Ideal for family get-togethers and homely holidays, we are near Parys, only 1hr 15min from Johannesburg, on tar all the way. If you’re just arriving or leaving from Johannesburg airport, our place is a convenient port of call. Rustic accommodations include a large guest house, bush camp and chalets, all equipped for self-catering. Don’t wait – we book out well in advance – so call Karen at 082 475 8767 or info@otters.co.za. Chill out in the warm autumn sun! Otters’ Haunt, on the banks of the Vaal River, is the ideal holiday getaway for families and friends. You can relax, read a book and listen to the birds. We cater for birdwatching groups and have a list of the species spotted so far – including rare types like the black-shouldered night heron. Fish eagles, many species of waterfowl and kingfishers throng the river and its banks. Indulge yourself eating out in the nearby town of Parys. There are antique shops, good restaurants and coffee bars, artist’s studios and township tours. Or tour the magnificent Vredefort Dome with our expert guides. Tours cover the geology of the meteorite blast that created the biggest and oldest visible impact crater on earth 2 billion years ago. We also offer battlefield tours, ecology and geography for schools, and research to order for visiting specialists. Bring your dog – provided it’s not a savage beast – to our pet-friendly establishment. There’s room to run on our lawns and in the fields on our property. Take a leisurely walk along the Vaal islands or hike in the spectacular Dome Bergland. We have access to numerous trails and we provide a trail briefing and map, as well as a well-informed nature guide if you want one. There’s plenty to do – and not to do! Special rates for families and groups. Only just over an hour from Johannesburg and you are in a different world! Otters’ Haunt is an old-established rustic place with a variety of types of accommodation. We are old-style hosts who welcome you and show you around, tell you about the place and encourage you to enjoy surroundings. Give Karen a call at 082 475 8767 or email info@otters.co.za. 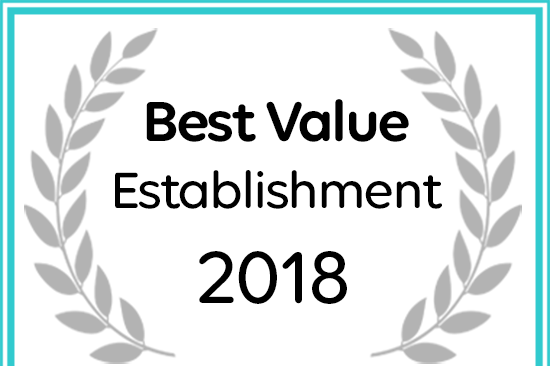 Otters Haunt wins 2018 Best Value Establishment Award! We’ve been rated as a top value accommodation destination in Parys, based on consistent and excellent rates offered by Otters Haunt to guests. We just love this picture of two boys meditating during a family river trip on the Vaal. I guess their parents are into Eastern religions and they’ve picked it up. Imagine how much of a better place the world would be if all youngsters learnt to delve into themselves to find peace in the universe. Hire a canoe and go out on your own or go with a guide who knows the islands and the wildlife. Our grand old oak tree has produced thousands of acorns – great food for pigs! We don’t keep pigs ourselves but occasionally some monstrous visitors like the one in the photo come crashing through the fields next door. Our dogs go crazy and there is much scurrying around to get the pig to gobble-n-go. Meanwhile, autumn is on the way. It’s a beautiful time of year. The Easter holidays are coming and we are enjoying some of the best weather ever – not too hot, not cold or windy, just lovely days. Everything is green but turning to yellows and lush browns. Our rafting continues into April. Hopefully, recent cyclone Irina has dropped some rain in the Vaal catchment and we can expect a good flow for the remainder of the season. As the weather cools off we start mountain biking in earnest. There are great off-road trails in the Dome Bergland and the rolling Free State platteland. One of our favourites is the ride to the Inlandsee, the salt pan at the centre of the Dome (picture). At this time of year we expect fly fishermen to turn up looking for good catches among the yellowfish that have fattened up in the summer flow of the Vaal. No-one eats the catches, it’s cath-and-release. The fish are rising everywhere as mayflies congregate over the water. Come and enjoy the adventures with us! We’re in the process of revamping our popular Otters’ Haunt website. For a while there will be limited information and changes will be going on. For all accommodation inquiries call Karen at 082 475 8767 or 056 8181814. Meantime, we’d love to hear your suggestions for changes to this website. Insert a comment or drop us a line to info@otters.co.za or call Graeme at 084 245 2490. Accommodation: Guest House, Bush Cabins, Guinea Fowl Cottage and Porcupine Flatlet. Activities: Whitewater rafting, wilderness canoeing, mountain biking, hiking, flyfishing, birdwatching. We also have a conference centre suitable for groups up to 20 – ideal for brainstorms, presentations and meetings. Our facilties are self-catering but for events and teambuilds we offer full board with delicious meals. We do Vredefort Dome tours and can handle school and university groups. So get hold of us to plan your getaway at the Vaal… we’ll put together the package you want.